Prince Charles and the Duchess of Cornwall are in Northern Ireland for a two-day visit. They began their trip by travelling to the Seamus Heaney Homeplace Centre in Bellaghy, where they met members of the poet's family. The Royal couple will attend a series of engagements in Londonderry, Belfast and County Down during their visit. 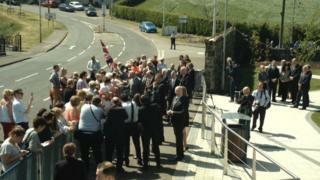 During their visit to Bellaghy, the Royal couple toured the visitors' centre. The village inspired many of Seamus Heaney's most memorable lines. Prince Charles has had a long interest in the Nobel prize-winning poet's work and met him on a number of occasions. After leaving Bellaghy, they met staff and patients at the North West Cancer Centre at Altnagelvin Hospital in Londonderry. On Tuesday evening they attended a musical gathering at Hillsborough Castle, in County Down. Image caption On Tuesday evening they attended a musical gathering at Hillsborough Castle, in County Down. They are also expected to officially open a memorial garden to members of the Police Service of Northern Ireland (PSNI) who were killed while on duty. On Wednesday, the couple will begin an official visit in the Republic of Ireland, at the request of the British government. Their engagements are expected to include meetings with Taoiseach (Irish prime minister) Enda Kenny, Irish President Michael D Higgins and a visit to Kilkenny Castle. They are also expected to attend ceremonies at Glasnevin Cemetery in Dublin to commemorate those who lost their lives in the World War One and during the Easter Rising. A statement from Clarence House said: "This visit will showcase the strength and vitality of the connections between the United Kingdom and Ireland; and the friendship and partnership that has defined our relationship over recent years. "The Prince and Duchess's programme will allow them to honour those men and women whose sacrifice in times of conflict shaped our two countries' shared history; and to celebrate all that we do together to cement peace and secure a prosperous future." Prince Charles and the Duchess of Cornwall last visited Northern Ireland and the Republic of Ireland in May last year.